Voices of Morebath | Wendy J. Dunn, Award-Winning Author. Primary documents provide us the opportunity to hear the voices of people from the times in which they lived. 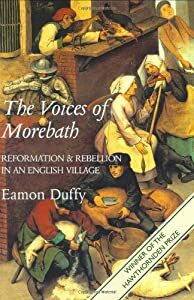 By his meticulous deciphering of the parish accounts written by their vicar during a period stretching over fifty years, Eamon Duffy’s The Voices of Morebath affords us a fascinating glimpse into the lives of the inhabitants of a Tudor village – men and women living during the Henrician Reformation, the all or nothing Reformation of Edward, the about- face times of Catholic Mary and, finally, the adapted, made to measure Reformation of Elizabeth. Duffy’s skilful examination of Morebath enables us step back into the communal fabric of this remote, sheep farming Tudor village. We see how, in their pre-reformation world, each adult person- male and female- had a role and that most were prepared to do their duties by the community – a community held together by religious rituals. “[W]hether he thought well of religious persons and the religion that was then used. When he replied that he had indeed thought well of the monks, having had no occasion to think otherwise, his son asked ‘then how came it to pass you was so ready to destroy and spoil the thing you thought well of? What could I do, said He: might I not as well as others have some profit of the the Spoil of the Abbey? For I did see all would away, and therefore I did as others did’ (Duffy 2001, p. 91). Duffy describes how Morebath eventually comes to see the Elizabeth Reformation as being like ‘quite literally, part of the furniture” (Work cited, p. 177). Even the Saint Sidwell loving Trychan eventually slides comfortably into the England of Elizabeth, when his ‘conformity was more than a grudging minimalism’ (Work cited, p. 175). One thing particularly drew my attention. 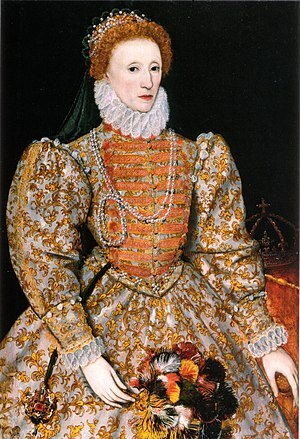 Duffy’s research points to the fact that Elizabeth’s successful reign may have had the effect of decreasing the status of women in the village. The women in the village were accepted by the men folk of the village as churchwardens and thus leaders in the past, but their leadership became less comfortable during Elizabeth’s reign. Could it be, I wonder, a counter-reaction by the men to a powerful woman ruler on England’s throne? Duffy includes throughout the pages of his book humourous turns of phrase- for example, he describes the Henrician reformation of the late 1530’s as a tiger, but a “torpid tabby cat’ (Work cited, p. 111) by the death of Henry VIII, while ‘Somerset’s regime was prone to see traitorous popish priests under every bed’ (Work cited, p. 131). He also gives an unmistakable sense of how the ordinary folk of the village must have felt like spinning heads- Roman Catholic one moment, Protestant the next, Roman Catholic again and then back on the reformation road in Elizabeth’s times. With their churches whitewashed and beloved icons ear-marked for destruction, these times for the devoted Roman Catholic were heart-breaking. Clearly liking Sir- a honour title given to catholic priests at the time- Christopher Trychan, Duffy makes his reader empathise with the priest too. Trychan cared not only for the spiritual well being for his parishioners, but also acted as the ‘voice’ for the one hundred and fifty souls coming under his care. Thanks to Duffy’s book- beautifully produced by Yale University Press– it is a voice that vividly returns the Tudor village of Morebath back to the historical stage.